The media love cancer — what causes it, how to prevent it, who has it. Cancer is something that potentially touches everybody in a dramatic way, and therefore public interest is keen. There’s a lot invested in cancer, particularly in the area of early diagnosis. An article in the May 26 issue of Toyo Keizai discussed the industry surrounding cancer screenings, which some doctors now question. Although early diagnosis is considered vital, mis-diagnosis or, more significantly, “over-diagnosis,” is a serious problem, since it leads to unneeded surgeries or treatments that can be just as harmful as the disease itself. However, the article says that Japanese news outlets rarely if ever reports on these doubts, which are becoming more widespread in the international medical community. Toyo Keizai reports that too many doctors, nurses and technicians are involved in the business of cancer screenings in Japan. Various public corporations also exist, including the Japan Cancer Society, that “create a lot of work” that would be at risk if people didn’t receive regular cancer screenings, which generate ¥90 billion a year. The establishment of the Japan Cancer Society was supported by the Asahi Shimbun in 1958, and to this day the organization’s head director is always an Asahi Shimbun executive. In other words, one of the country’s major newspapers has a stake in the continuation and growth of cancer screenings. Due to cancer’s reputation as the star of diseases this situation is not likely to change, but in a sense it’s being nudged out of the spotlight by another illness — dementia. News outlets are now compelled to share their unconditional love with ailments such as Alzheimer’s. Alzheimer’s Disease International estimates there were 46.8 million people in the world with dementia in 2015. In Japan alone, there were 4.62 million patients in 2012, and that number is expected to increase to around 7 million by 2025. In a forum about dementia that appeared in the Asahi Shimbun on July 4, medical researcher Atsushi Nishida cited an article in the British medical journal Lancet that said one-third of all dementia cases could be prevented if nine factors were eliminated from people’s lives. Among these factors were a lack of educational opportunity during one’s youth and deterioration of hearing during middle age. The article was widely reported, but Nishida said there is “limited evidence” that removing these factors would have the intended effect. However, it is widely assumed that one of the factors, chronic loneliness, has an incubating effect on the development of dementia. “People think that isolation is an individual’s own responsibility,” says Nishida, “and therefore not a public health concern.” However, the British government, for one, has created a ministry portfolio to address social isolation. A lot of money is being spent on research into early diagnosis and new drug development, but Nishida thinks more money should be invested in social structures that would reinforce cognitive capabilities. 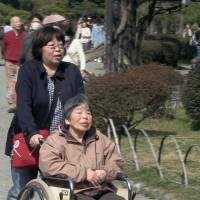 In the same forum, Katsunori Kondo, a Chiba University professor in the field of preventive medicine, recommends exercise to combat dementia, and the government agrees. However, Kondo says current promotional campaigns don’t work well because people who are normally disinclined to exercise are not being persuaded to do so for the sake of preventing dementia, so he suggests combining exercise with social engagement activities. Such programs are expensive, but those costs would be offset by the money saved on dementia treatment. The third participant in the forum, Yuka Sekiguchi, is not a medical professional or an academic. She’s a filmmaker, and she disagrees with the other two participants, but not because she thinks their ideas wouldn’t work. Sekiguchi, who has made three documentaries chronicling her mother’s Alzheimer’s, feels that people with dementia are liberated by their disease. She describes her mother as a proper wife and good parent, but in order to fulfill these roles she gave up many things that might have made her happy. Sekiguchi isn’t being flippant. Every dementia case is unique and it’s not useful to “force” patients into a uniform program of treatment, as shown by the often abusive environment surrounding institutional care. Society says dementia is a “problem,” but it’s mainly a problem for family and friends. To Sekiguchi, her mother’s condition is, at worst, occasionally inconvenient. It requires adjustments. Sekiguchi lived in Australia for 29 years, but eventually moved back to Yokohama when her mother, Hiroko, showed signs of cognitive deterioration. 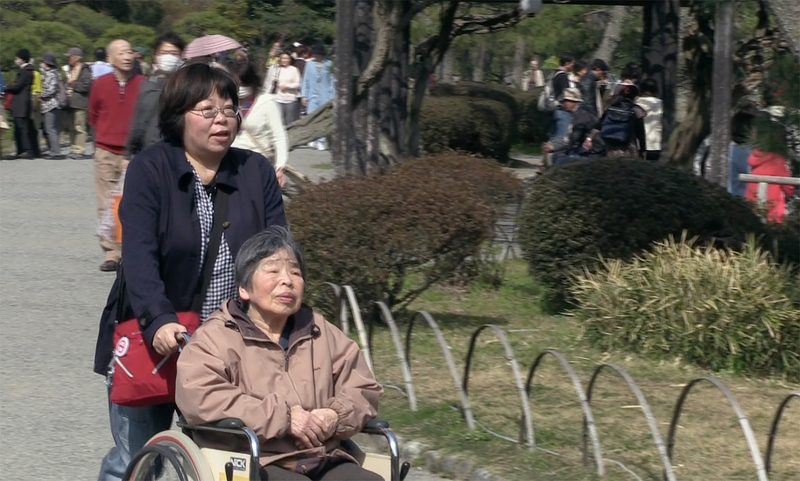 With her sister’s family living upstairs in Hiroko’s house, taking care of her wasn’t a major nuisance, and the first two movies in the series, “Everyday Is Alzheimer’s,” which cover 2009 to 2013, are almost lighthearted in the way they address Hiroko’s condition as a continuum of minor eccentricities and major forgetfulness as Sekiguchi attempts to carry out “person-centered” care. In the latest and last installment, Sekiguchi expands her exploration of dementia to end-of-life considerations. The 61-year-old director herself undergoes two hip replacement surgeries, forcing her to confront her own mortality. She travels to the United Kingdom to learn about palliative care and to Switzerland to find out about assisted suicide. In this context, Alzheimer’s is a final step on the road to oblivion, which is the real issue and one the media avoid when they obsess over prevention and treatment of cancer and dementia. “Medical people talk about treating dementia, not the person,” says a woman in the film who runs an “open” home for people with dementia. Her patients “do what they want,” and when they can’t any more, they die, naturally. Meanwhile, Hiroko keeps going at age 87. Some might even say she’s thriving, despite her affliction. She lives to eat, as Sekiguchi often jokes, and no one stops her. For more information on the nationwide screening times of “Everyday Is Alzheimer’s: The Final,” visit www.maiaru.com.